Western blot of nonreduced (-) and reduced(+) mouse IgG2b (20ng/lane), using 0.2ug/mL of RevMAb clone RM108. 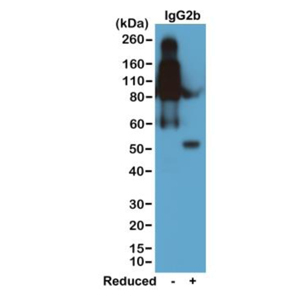 This antibody reacts to nonreduced IgG2b (~150 kDa) much stronger than the reduced γ2b form (~50 kDa). 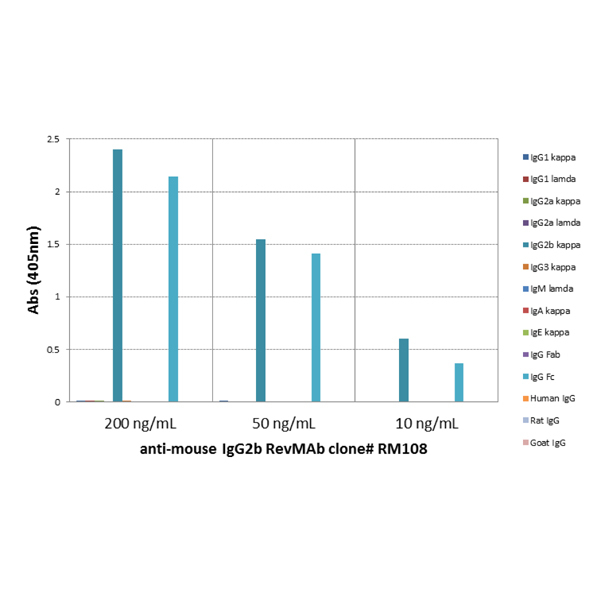 ELISA of mouse immunoglobulins shows RM108 reacts to the Fc region of mouse IgG2b; no cross reactivity with IgG1, IgG2a, IgG3, IgM, IgA, IgE, human IgG, rat IgG, or goat IgG. The plate was coated with 50 ng/well of different immunoglobulins. 200 ng/mL, 50 ng/mL, or 10 ng/mL of RM108 was used as the primary antibody. An alkaline phosphatase conjugated anti-rabbit IgG as the secondary antibody. A titer ELISA of mouse IgG2b. The plate was coated with different amounts of mouse IgG2b. 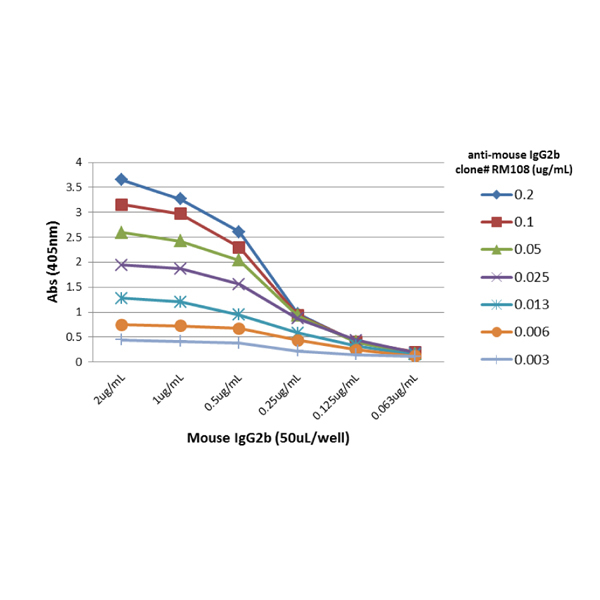 A serial dilution of RM108 was used as the primary antibody. An alkaline phosphatase conjugated anti-rabbit IgG as the secondary antibody.